This was the year that Apple became the first U.S. company to reach a $1 trillion valuation. It's been quite a year for Apple (NASDAQ:AAPL), one marked by meaningful milestones and progress on fundamental goals. Recent market volatility, however, has led Apple shares to give up all of their gains for the year, much like the broader market. Let's take a look at Apple's 2018. Apple was the first U.S. company to reach a $1 trillion valuation. The company had been in a heated race with Amazon.com to the $1 trillion threshold and narrowly beat the e-commerce giant to the finish line. Incredibly, the Mac maker accomplished this while trading at a discount to the S&P 500; shares were trading at around 17.5 times earnings when Apple's market cap hit $1 trillion, compared to the broader market's 24.3 multiple. Apple shares marched a bit higher in the subsequent weeks, with its market cap peaking at more than $1.14 trillion in early October. 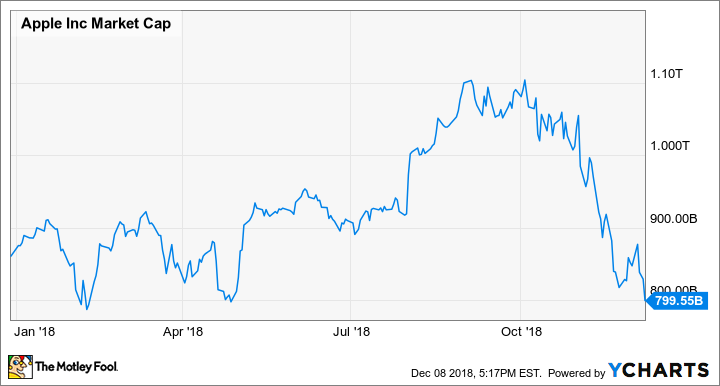 Apple shares have pulled back considerably since that peak due to several factors, including President Trump's ongoing trade war with China, the company's lackluster guidance for its December quarter, and the latest renewal of fears about iPhone demand. Growth in the services business is being driven by paid subscriptions, including Apple's first-party services like Apple Music and iCloud storage, as well as third-party services. The company added 90 million paid subscriptions through the third quarter and now has more than 330 million paid subscriptions. While Apple was already aggressively making share repurchases, tax reform supercharged its ability to buy back even more shares because the company could now access its overseas cash, which has long represented the bulk of its cash holdings. At the end of 2017, just days after tax reform passed, $269 billion -- or 94% -- of Apple's total cash was held by foreign subsidiaries. Apple then proceeded to immediately and significantly accelerate its share repurchase activity. The company repurchased more than $60 billion worth of stock in the first three quarters, which helped to boost earnings per share as it retires those shares. CFO Luca Maestri also outlined a new "net cash neutral" goal, vowing to bring the company's net cash position to $0 by returning capital to shareholders. As of last quarter, Apple still had $122.6 billion to give back. Apple kicked off 2018 by launching its first foray into the smart speaker market, the HomePod. Priced at $350, the HomePod has not been a strong seller compared to competing smart speakers, in part because it only supports Apple Music and no other music-streaming services. The company recently announced a partnership with Amazon that will bring Apple Music to the e-commerce giant's Echo smart speakers, but that may speak more to Apple's desire to expand in the services market than to its plans for smart speakers. Apple hosted an education event in March at which it unveiled a new entry-level iPad whose price starts at just $329. Apple is targeting the educational market with the new model, which added support for the first-generation Apple Pencil. Apple has been steadily losing ground in the educational market to Chromebooks, in part because of cost considerations. Over the summer, Apple refreshed its MacBook Pro lineup with faster processors and added other features like a True Tone display and a third-generation butterfly keyboard. Previous versions of the keyboard have been prone to reliability issues, resulting in several class action lawsuits. Of course, Apple always saves its most important product introductions for the fall. The company introduced the iPhone XS, iPhone XS Max, and iPhone XR in September alongside the Apple Watch Series 4. The iPhone XS Max will appeal to markets that prefer large phones, most notably including China, while the iPhone XR is positioned as a mainstream device with a lower price point, even as it includes many of Apple's latest innovations, such as Face ID. Apple then released the new iPad Pros in October, which also feature edge-to-edge displays and Face ID, in addition to a redesigned MacBook Air. In November, Apple announced a controversial decision to change how it reports financial results starting with its 2019 fiscal year. The company will no longer disclose data around unit sales (the number of iPhones or any particular device it sells) to investors, arguing that "a unit of sale is less relevant for us today than it was in the past." Although most of its rivals do not disclose unit sales, Apple is inevitably hurting investor transparency by adopting the same approach. Meanwhile, evidence continues to mount that demand for the latest iPhones remains soft, including supply chain reports that Apple has reduced production orders and official projections from a slew of iPhone suppliers regarding their own businesses. Despite Apple's efforts in recent years to shift investor focus away from iPhone unit volumes toward its services business, the market continues to emphasize how many iPhones Apple can sell, even though investors will no longer have direct insight into that metric going forward.